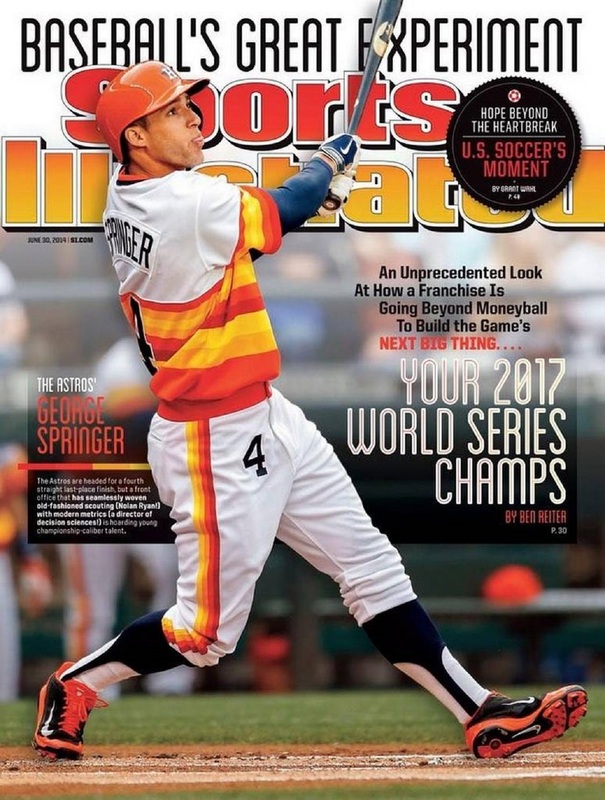 On the eve of the 2014 Major League Baseball season, Sports Illustrated ran a cover story – left, written by Ben Reiter – predicting that the Houston Astros would win the World Series in 2017 (link here). At that point, they were the worst team in baseball. Many had them as the worst team in the history of baseball. After Reiter’s piece was published, the Astros’ fortunes were transformed and last autumn –2017 – guess what? They became your World Series champions, defeating the Los Angeles Dodgers in the final game of seven. Q: When did you conceive of the idea for the piece and how long did it take to get access? Ben Reiter: We were drawn to the story for two reasons. One was that the Astros were historically bad. Over a three-year stretch they were the worst team baseball had seen in half a century. You start to think ‘What is going on down in Houston? How is this team so bad?’ Secondly, the guys who had joined the front office late in 2011 – including the general manager Jeff Luhnow – had very strong track records. They formerly worked in the scouting department of the St Louis Cardinals, which is one of the great long-term organisations in US sport. All of a sudden these guys go to Houston and are overseeing an abominable team. We wanted to know what was going on. It probably took a year of consistent communication to allow them to let me not only inside their offices, but inside their draft meetings. That’s the sort of opportunity that journalists don’t usually get. Q: Did you ask for the access to centre on the draft? BR: Yes. In 2014 the Astros had the unprecedented privilege / curse of picking first overall in the amateur draft. I thought if they would allow me to sit in with the process of picking, it would make for a good element of the story. It was 1hr and 40 mins when they were openly discussing the top six players they were considering. I had never been in a meeting like that. They had 40 guys from the front office – the scouts, data guys, all of the brain power in one room offering their opinions on these six players. By the end of the day it was clear that they were circling around Brady Aiken, a left-handed pitcher from San Diego. They thought this guy had the chance to become one of the greatest pitchers of all time. It was very risky in that only two high-school pitchers had ever before been picked first overall. He would be the third. The reason it was risky is that so much can go wrong between being a 17-year-old High School pitcher and becoming a Major League pitcher. You can get hurt, you might not develop – it’s the riskiest category of player there is. But I knew the Astros picked Brady Aitken despite the risk because they thought he had the chance to be an all-time great. BR: At the medical, the Astros discovered something in Brady Aiken’s elbow. It has been widely known that he had an issue with his ulnar collateral ligament in his left elbow, which is the most important ligament for a pitcher. The Astros get this result and immediately drop their offer to Aitken. It was very controversial. So, they become the third-team ever not to sign the No1 overall pick in the draft. It was another sign that the Astros were a laughing stock. But everyone overlooked one thing: by not signing Brady Aitken in 2014, by rule they receive a compensatory pick the following year – for the No2 overall pick in the draft. The upside of the story is that 12 pitches into Aiken’s next start at IMG academy, where he went instead of going to the pros, he tore his elbow and the Astros – in the No.2 pick of the 2015 draft – selected Alex Bregman, who just a couple of years later has a game-winning hit in the World Series. BR: That’s right. Aitken was a setback for the Astros, but they stuck to the process and the process told them that no decision is final until you have no more outs. Many teams would have signed Aitken despite his medical report but the Astros’ system told them ‘no’ and as a result they ended up with a player who was probably the best player in both the 2014 and 2015 draft, in Alex Bregman.